I suppose everyone does bonsai for their own reasons, some for fame and fortune, some for a reason to get out of the house, some for the love of working with nature, some for the pure art of it. The last two hold true for me but the main one for me is friendship. A lot of these friends are local to me but many of you I have never met, just quick chats via social media and if I’m lucky, a face to face chat at an exhibition or two. There’s nothing like sitting around with fellow bonsai enthusiasts and just enjoying bonsai. 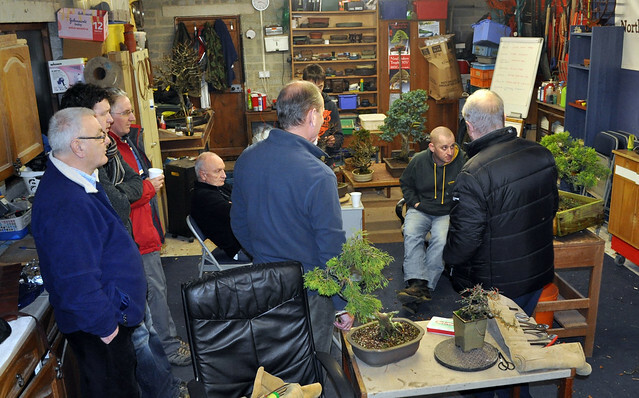 The photo below is from a recent session in my garage exploring options on trees and then putting them into action. This in another aspect of 2016 that I plan to increase, good honest enjoyment of bonsai in every way. That’s awesome! Please let me know when you get closer. I would love for you to visit and show you some trees. I also live about 25 minutes from the Pacific Rim Bonsai Museum.